Argentina recently passed an anti-terrorist measure which sounds like a version of what the U.S. government is already doing here surreptitiously. From the nation that defined Latin-American fascism. Already in a U.S. neighborhood near you. When did we ever aspire to be like them, anyway? Guns, Holster and Gear shows us a new-fangled device certain to revolutionize sport shooting. A ‘how many are left in your magazine because you can’t count’ device! When I first began competitive shooting, reflexively, I counted my shots. That was how I knew it was time to reload. Then, a more accomplished shooter advised me that under stress, one is unable to count one’s shots. So, reluctantly taking their advice, I stopped counting. And my competition scores got worse. I should have kept counting, dammit! Hopefully, tacticool mall ninjas won’t decide to adopt this for their carry guns. I personally just see it as one more thing to break. Don’t You KNOW if You are a Citizen? Weasel Zippers has a link to Politico . Seems the current administration has a ‘free’ 24 hour hotline, to help illegal immigrants who have been arrested. ~As states across the nation ramp up their efforts to catch illegal immigrants, the Obama administration on Thursday launched a new free hotline for people busted on violations to get help. The hotline will have translation services available in several different languages. ICE personnel will gather the caller’s information and send it to a field office for immediate action, according to the press release. Of course this has nothing to do with his (The President’s) tanking approval rating among Latino voters. Our tax dollars at work, yet again. If they think they may be U.S. citizens? You don’t know if you are? I’ve no problem with due process for suspects of illegally being in the United States, however, I think they would know if they are U.S. citizens, or not. Maybe. MORE Government Control – Quelle Surprise! The law was prompted by a spike in the use of cough syrup as a recreational drug. I suspect as they inspect incoming Arizona vehicles for ‘buggy’ produce, they will now begin inspecting incoming California vehicles for cough syrup. Hey! California’s creating new jobs for dismissed TSA folk! Good job! I’m a libertarian. Small L. While I follow the national party news, I’m not a member. I’ve been a registered libertarian voter since 1976. I’ve no plans to endorse any specific candidate in this blog. Of course, that may change. Currently, I know I’m not a fan of the class-warfare, income-redistributionist, nanny-statism, big spending policies of the current administration. I’m not a fan of the PATRIOT Act, TSA, and Department of Homeland Security efforts put in place by the previous administration, either. Which brings me to the question. In the Modern World, should the United States remain the World’s Policeman? (Monroe Doctrine 2.0) Hard corp libertarians say no – stay out of foreign entanglements, as President Washington desired. Others say, it depends on the situation. Weasel Zippers has a link to Big Government, wherein Candidate Ron Paul, Republican nee Libertarian, was asked this very question. As if he were in FDR’s shoes, at a time when the United States was not in danger of attack from Nazi Germany, BUT, had knowledge of the activities of the Holocaust. Candidate Paul responded in the negative – NO, he would NOT have used United States resources, would not have risked American lives, to end the Holocaust (under the conditions posted in the question). Of course, The United States WAS at risk of invasion as the European continent was falling to the national socialists. So the wording of the question may be fallacious. But, it begs the point. As a nation should we confront evil, wherever we find it? Just because it is evil? How many dictators have we supported because they were ‘friendly’ to the United States? Or had resources we needed? And how many oppressive regimes did we ignore? Or simply choose not to combat? Should we have? Or should we always be isolationist, protect our borders and turn a blind eye to the rest of the World’s problems? I personally don’t think we should be wholly isolationist, but, don’t think we should be jumping in everywhere, either. The Sudan? Somalia? Iran? North Korea? Where does our interests outweigh our neutrality? Just a fun thought for your drive to work this morning – Happy Motoring! Purse Strings? WHAT Purse Strings? Obama is essentially saying he won’t be bound by the bill that prevents him from doing anti-gun studies on the taxpayer dime. “I have advised the Congress that I will not construe these provisions as preventing me from fulfilling my constitutional responsibility to recommend to the Congress’s consideration such measures as I shall judge necessary and expedient,” Obama said in a statement as he signed the bill into law. I can’t find that clause in my own copy. I just find “No money shall be drawn from the treasury, but in consequence of appropriations made by law.” Maybe I’ve got an outdated version. But I’m sure my copy of the anti deficiency act is up to date. So is the provision making violation a felony. The President isn’t just skating on thin Constitutional ice here, he’s staking on water, and he’s going to sink of he follows his words with deeds. The President is playing fast and loose. But, hasn’t he always? A number of bloggers have set upon the meme regarding cheap firearms. Some involving getting started when young and not having the funds, others of an economy bent. The first gun I thought about purchasing (in 1973) was a 4″ Rohm (RG) .38 revolver. Some guy at work was trying to sell it. $65? I knew nothing of revolvers and a more-gun-educated friend rapidly steered me away from doing so. It seemed they were cheaply manufactured in Germany during the 60’s, largely of pot metal. The flash gap between the front of the cylinder and rear of the barrel was not only not parallel, but one could throw an elephant through it, and his feet wouldn’t touch the sides! Glad I didn’t buy it. I bought my first gun, in the Spring 1974. A Smith & Wesson Model 39-2, 9 mm. from a reserve university cop buddy of my Dad’s, for $125.00. With two magazines. I purchased it largely because of it’s look, and more BB’s than a six-shooter. Knowing what I know today, I probably should have saved-up another $100 and bought a 1911. This particular Smith shot okay, but had an alloy frame. Some folks think all steel is more durable. Over my firearm purchasing career, most of the guns I bought were based on price and gun lust. Sometimes, just because I’d a few extra dollars (a not very-common occurrence). I traded the 39-2 for a Smith 59 (with cash-thanks again, Dave! ), because it was more BB’s, and, I thought, the same gun. WRONG. While similar and of similar materials, the action was worse, and I couldn’t hit much with it. A clunky ammo-burner. Later acquired was a S&W Model 49 revolver, because it was $100 cheaper than the stainless model 60 Smith snubbie. Again, a wrong choice. Mostly because blued guns dissolve instantly upon contact with my perspiration. I bought a Keltec 9mm, because I liked my little Keltec .32. It was well worn and didn’t shoot well at all. A waste of money. For me, in the gun world, price is important. Generally speaking, one gets what one pays for. Back in the 70’s, a Rohm at any price was worthless. Still is. A Smith 39-2 was ‘okay’. Much depends on how hard one intends to use it. I suppose the Keltec 9 was ‘okay’, if the target was not much farther than arm’s length. Some would say (and have-I’ve seen them on gun forums) ‘any gun is better than no gun.’ A Rohm, for instance. Perhaps. But, do I want to count my life on it? I always believed a Smith revolver was like a Ford or Chevy; a Colt revolver – a Cadillac (trading on the name, but good). A Ruger, like an old work truck – not stylish, but works forever. That was in the 70’s. Today factor in Sig, Kimber, Springfield Armory, Glock and a hundred others. In the real world, sometimes, you just gotta improvise. My weight ‘fluctuates’. As such, my clothes don’t always fit correctly, or the way I’d prefer. One time, a weak leather dress belt (not designed for supporting a holster and 39 oz. firearm – lesson learned!) simply broke. Pants almost fell off, containing broken belt and holstered firearm! I was able to keep everything from dropping, adjourned to the men’s room, and put the armament into my briefcase. Held my pants up manually, the rest of the day. As recounted in a previous post, in another situation, I was unable to remove my suit coat for fear of revealing my firearm, inappropriately. Another time, I was CCW’ing, and was wearing a wool overshirt. The heat became oppressive, and my female companion (my ex-wife) suggested I tie the sleeves around my waist to cover ‘stuff’! Brilliant! Maybe if you’re a cop, or a SpecOps guy, but civilians have to deal with civilian laws and rules. Sometimes, guns and gear change. Like me, no way am I carrying my 1911 in 115 degrees. 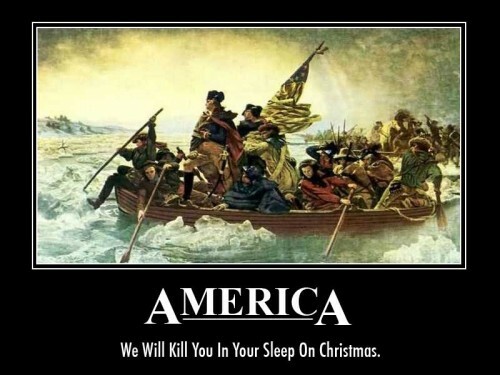 Obviously, General Washington didn’t take Christmas off as a Federal Holiday.